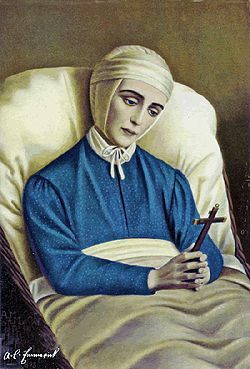 Blessed Anne Catherine Emmerich (1774-1824) is without a doubt one of the most fascinating and complex mystics in a Catholic Church that already boasts a very large number of fascinating and complex mystics. From the time she was a tiny child, Anne Catherine experienced constant, vivid, often disconnected visions of faraway places, times, and individuals. Scrutiny of her descriptions indicates an uncannily detailed and accurate knowledge of countless things that she could never have directly experienced or even heard about, considering where she grew up and subsequently lived, her low level of education, and her limited circle of friends. To take an example, her descriptions of early Christian liturgical practices (such as wearing the Blessed Sacrament in a sort of pyx, receiving It in the hand on a cloth, receiving under both kinds) are striking, matching the scholarship of a later period, and utterly unlike the Church worship she was familiar with in her time. Unfortunately, Anne Catherine has been ill-served in English. Until quite recently, the available translations represented but a tiny sliver of her marvelous range of visions, edited with pious intentions and rendered in a stiff style. It would be like having only one Book of the Confessions, The Imitation of Christ, or the Showings of Julian of Norwich, each expurgated and translated by Edward Pusey. I say "until quite recently" because Angelico Press began to fill the void in 2015 with the release of a handsome set of 3 volumes, The Visions of Anne Catherine Emmerich (vol 1, vol 2, vol 3) which include extensive maps and hundreds of illustrations, and significantly improved translations of the texts. 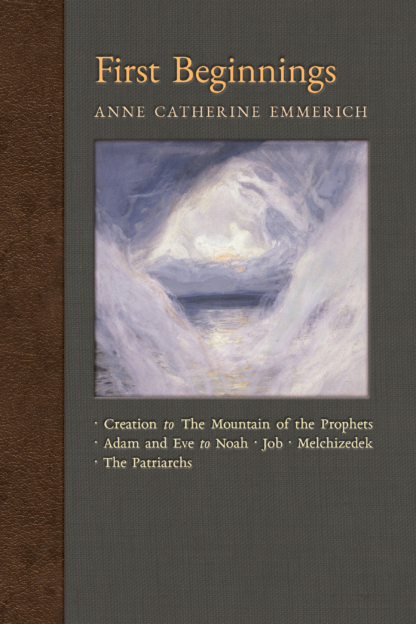 Angelico has just announced the publication of an even more impressive series: New Light on the Visions of Anne Catherine Emmerich, 11 matching volumes of the mystic's visions, plus a biography, all in both paper and cloth. These volumes, containing huge amounts of text never before published in English, represent the fruit of more than a decade of research and translation by James Wetmore. In 2009, the original notes of Anne Catherine’s visions, in 38 notebooks, became available for reference for the first time, and the present series incorporates much new material from them. With regard to individuals and themes, every reference thus far located in the notes and in prior translations have been woven together so that the reader can easily find in one place almost all of what Anne Catherine had to say on any topic. 10. Inner Life and Worlds of Soul & Spirit: Prayer, Parables, Purgatory, Heavenly Jerusalem, Revelations, Holy Places, Gospels, etc. First Beginnings commences with the visionary’s account of Creation, the Fall of the Angels, the formation of the Earth and Paradise, and the mysterious Mountain of the Prophets. The second part presents Adam and Eve, the Trees of Life and Knowledge, the Fall of Humankind, the Promise of the Redeemer, Cain and Abel, the Children of God, the Giants, Enoch, Noah, the Tower of Babel, and such ancient figures as Hom, Jamshid, Nimrod, Derketo, Semiramis, and Melchizedek, concluding with Job. 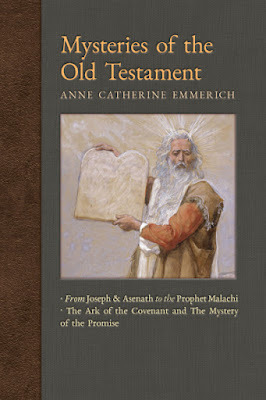 The third part offers fascinating new insights into the lives and missions of Abraham, Isaac, and Jacob. Mysteries of the Old Testament commences with an account of Joseph and his wife Asenath in Egypt, with special focus on “The Mystery of the Promise”—perhaps the most unique and powerful theme running through all these volumes. Fresh perspectives are offered on Moses, Samson and Delilah, the Nazirites, Elijah and Elisha, Tobias, Ezra, Zoroaster, the Holy Book of Ctesiphon, and the final prophet, Malachi. The second part is thrilling, passing through several stages of the Ark of the Covenant, which reaches its consummation, in its fourth and final form, in the Virgin Mary herself. As time permits, I hope to share with NLM readers extracts from these volumes that pertain to the sacred liturgy. There are many such passages. I have been edified, dazzled, perplexed, nourished, and moved by what I have read in these new volumes, and can give them my unqualified recommendation.